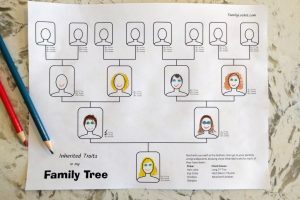 When my family travels anywhere that has a connection to our past, we do our best to teach our children about their family history. 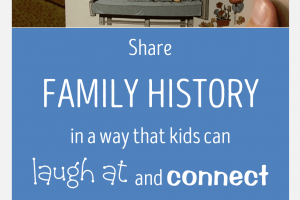 Children can experience family history first hand when they do “field trips” to family sites. Experiencing the places of significance to our ancestors has great potential for being memorable and fun. In the very least, it will be a photo op to help you remember for years to come. Children are used to touching, exploring, and discovering their environments. They delight in finding new places to have adventures. Exploring physical locations can be the perfect precursor to discovering genealogical information in historical records. Travel in and of itself is a powerful learning tool for children – from reading a map, to learning about different cultures and peoples, kids learn more than we realize as they explore. Learning through travel is becoming a trend with “worldschooling” families ditching traditional learning from a book and helping their kids learn through experiencing new places. What have your children learned as you have traveled with them? What did you teach? As a family historian, I have taught them about our family history whenever possible. Here are some things that we have done in the past. 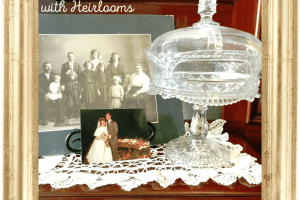 I hope these ideas for how to incorporate family history into your family vacations can be useful. Reenacting our Mormon pioneer ancestors’ handcart trek is a highlight of our family history travel experiences. My grandmother invited us to a reunion that her cousin was putting on for the descendants of our handcart pioneer ancestor’s son, Charles Cannon Creer. It was held at the Mormon Handcart Historic Site at Martin’s Cove, where the visitor’s center details the handcart trips of 1856, especially the last two handcart companies whose late start spelled tragedy. We met up inside a little cabin on the Mormon Handcart Historic Site and all the families wore different colored name tags to show which child of Charles Cannon Creer they are from. My son dressed up like a pioneer. Another family had dressed up in pioneer clothes also. After some introductions, we were divided into groups to tour the historic buildings of the Sun Ranch. The LDS Church bought the Sun Ranch in the 1990s to create the Mormon Handcart Historic Site and visitor’s center. Several of the ranch buildings are set up just as they may have been 100 years ago. We saw the Bunkhouse, wash house, and blacksmith shop. The blacksmith pounded some nails into rings and let all the kids choose one. The larger ranch houses had been turned into museums with old artifacts – guns, hats, animal pelts, pictures, handcarts, etc. At another part of the Historic Site is a replica of Fort Seminoe. The Wyoming State Archaeologist’s Office and University of Wyoming conducted an archaeological dig at the site of an old trading post along the westward trail called Fort Seminoe. After the tour of the Ranch and the Fort, Mom and I changed into our costumes and presented a dramatization of Sarah Jane Miller and her mother Ann Miller, our ancestors who pulled handcarts to Utah. They were in the first handcart company of 1856 and most all of their company made it safely to Utah. We organized into handcart groups and got ready to hike up to Martin’s Cove, an area near the hills where the Martin Handcart company, one that left much later in the summer, sheltered during the winter of 1856. Many died there. All the kids were excited to start pulling the handcarts, but their excitement quickly wore off as the drudgery of pulling a heavy cart set in. My daughter was a baby then and I carried her in a baby bjorn carrier. When we got to the cove, we took a picture with all the reunion, and then we listened to the tour guide share a couple stories. At another reunion a few years back, my husband’s extended family gathered in Alamosa, Colorado, to where his great-grandfather farmed and his grandfather grew up. His great-great grandparents lived and were buried in Sanford, a neighboring town. One of our activities was to form a large caravan and drive to the old farm. The lead car took a wrong turn and our long line of about 15 vehicles lined up on a small road next to a canal while they figured out where to go. It was pretty to be out in the country. When we found the farm, we took a lot of pictures and saved the location in our GPS. For another part of the Dyer reunion, we visited the Sanford cemetery. We found the family plot and realized that grass had grown over several of the graves of the children in the family who had died as infants. The young people in our group worked fastidiously to uncover the gravestones. My in-laws live in San Diego and we go there to visit all the time, since it’s only a 6 hour drive from Tucson. Two years ago we went to the Mormon Battalion Museum in downtown San Diego and saw a replica of our ancestors’ journal kept during the march of the Mormon Battalion from Illinois to California. The museum was interactive and exciting and afterward the kids got to experience brick making and panning for gold in the outdoor exhibit. 5. Find Names of Ancestors On Landmarks, Monuments, etc. We recently attended a family reunion in San Diego that focused on my husband’s grandmother. She passed away several years ago. We visited the Oceanside Pier as part of the reunion and the children were gathered around and told, ” Grandma Ada’s name is carved on the railing somewhere on the pier. Whoever finds it gets a dollar!” The cousins all raced off to find it. When it was found, we all took pictures with the name. The names carved on the pier were done in an effort to raise money to help fund Oceanside’s Centennial Celebration in 1988. Ada lived in Oceanside a long time. While we were talking that day, we learned many stories about Ada’s life and work. We went to Taylor, Arizona a couple years ago for Memorial Day. We found where our ancestors were buried, visited the cabin our ancestor lived in, and did a historic homes tour. I wrote about many of the things we learned from this trip here: 8 Tips for Planning a Family History Memorial Day Road Trip. The historic homes tour was wonderful because we learned about what life was like when our ancestors lived there. We heard stories about others who lived in the town and became more familiar with the local history. Our kids enjoyed seeing all the artifacts and exploring inside old pantries, attics and historic rooms. When we were driving home from Utah once, we decided to take a break from our long day driving to see if we could find the grave of our ancestor Myra Mayall Henrie. She worked in Panguitch as a school teacher and is buried there. We stopped, stretched our legs, and found a large monument at her grave. We dressed up like pioneers last month and visited the “This is the Place” Heritage Park living history museum in Salt Lake City. One of the volunteer families included a little girl who gave us a tour of a pioneer kitchen. We also saw a blacksmith shop and did lots of activities like panning for gold and digging for gems. It was the perfect place for children to experience pioneer life. One of my favorite things was the pioneer games spot. We tried walking on stilts, but it was hard! That’s it! Tell us in the comments what family history travel you’ve done with kids. Love these simple eight ways. Can’t wait to incorporate more into our future family travels!